Think about a small group of friends. All have just finished university and most now have a job they will devote their life to. As a reminder of what once was, this group of friends sets out into the woods to bury a time capsule to be retrieved at a later point in their future. Sounds like a great idea, right? Now imagine this group finds the perfect spot to hide their capsule and starts digging. After a short while they find something: a bunker. Not of the military kind, but rather a time capsule created and left for them by their 20 years older counterparts. Creepy, right? Finally imagine that this group of friends opens the bunker and finds out that they bring on the end of the human race. 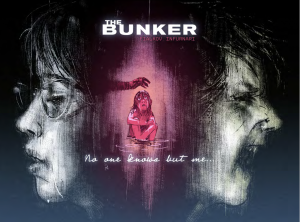 This is the story of ‘The Bunker‘, created by Joshua Hale Fialkov (story) and Joe Infurnari (art) and published first by Hoarse and Buggy Productions and from February 2014 onwards by Oni Press. Told in sketchy black and white pictures, it is a twisted tale of making the right decisions at the right times. Highly recommended!